This is part two of my three-part series of posts about what I recommend on a visit to Scotland. I'm writing posts because I get asked a lot and this is easier than repeating myself a bunch of times. You can get part 1 of the series here – dealing with Glasgow, Edinburgh, and Stirling, and general links to agencies and our past photo posts – and part 3 of the series here – dealing with driving tours of the west and north west. Some of the coolest places to visit in Scotland are the various islands. I haven't been to the Orkney, Shetland, or the Outer Hebrides (Lewis, Harris, etc) but I have spent several months of my life over the last 20 years exploring Skye (and I'm taking Kimberly and our girls there in July). The Gaelic name for Skye is Eailean a' Cheo, which stands for Island of Clouds. It's a gorgeous place with high, jagged mountains (the Cuillin), fabulous sandy beaches, and breathtaking views. But it can also be very wet and windy, especially on the western side of the island that looks out over The Minch – the stormy body of water between Skye and the mainland and the Outer Hebrides. Winds up to 80mph have been recorded with average rainfall on the island of 60-80 inches. Best time for good weather is May. 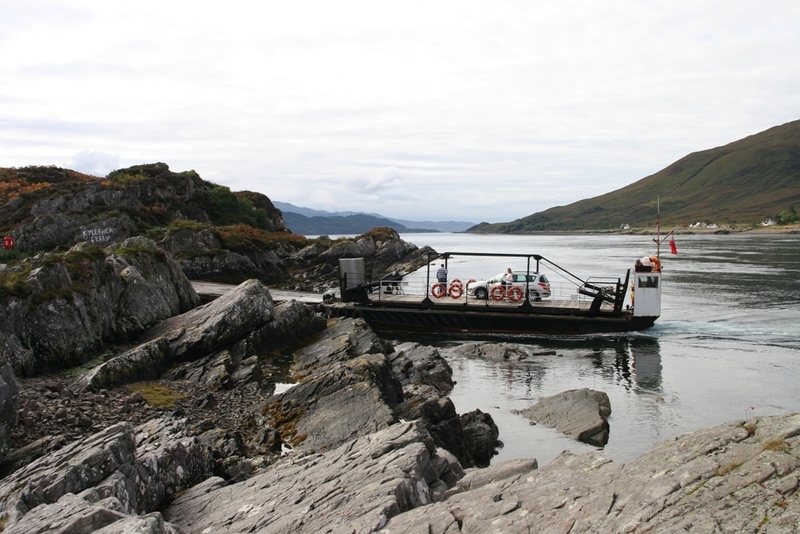 When I first started going to Skye, you could only get to it by ferry, with the main ferry operated by Caledonian Macbrayne and taking a couple of minutes to go from Kyle of Lochalsh (on the mainland) to Kyleakin (on Skye). Now it's been replaced with an ugly bridge between the two that was the cause of much protest when it was built in the 1990s. I'd advise you to take the ferry that goes between Glenelg and Kylerhea (here it is when we got off it in 2009). There's another multi-hour ferry that goes between Mallaig (on the mainland) and Armadale on Skye. I've never taken it. It's called the Glenelg ferry. This is a 6-car ferry and is the only surviving turntable ferry in Scotland. It's a far more romantic way to get to Skye than going over the bridge. The narrow waterway that the ferry crosses has one of the strongest tidal rushes in the UK – more than 12 knots during a Spring tide. When you get to the other side, take the first right into a little car park. It's the car park for the short walk to the sea otter viewing hide – I've seen them before! You'll notice that most of the roads apart from the main A87 up to the Outer Hebrides ferries at Uig, parts of the Portree to Staffin road, and parts of the Sligachan to Dunvegan road, are single track roads. They're excellent fun to drive in something like a Landrover and I advise renting an SUV of some kind. I get mine from Aberdeen 4×4 – they'll deliver/pick-up anywhere in Scotland and have a good range of quality cars/SUVs at decent prices. Rather than write an essay on all the places to see in Skye, here's a bullet list with Wikipedia and other links for places I think are worth visiting. The drives to all these places are worthwhile and I'd recommend driving to the end of every road on the island to see all kinds of ruined castles, old churchyards, and great views. Clan Donald Centre. This is in the remains of Armadale Castle (former home of the MacDonald clan) and is also near the ruins of Duncaith Castle (tiny little road to get there). I've camped a few times in the bay at Tokavaig. The Cuillin. Some of the best hill-walking and mountaineering is in the Cuillin mountain range, plus some hard-core climbing on the Inaccessible Pinnacle. These mountains can be seen from most places on the island, and a good portion of the mainland coast. A good starting point is Sligachan in the middle of the island, where there's a large campground, hotel and pub. Sligachan is also where the main road splits off to Dunvegan from the main A87. Elgol. There's nothing much here apart from a small harbor, but the drive to the end of the peninsula is worthwhile. You can also walk along the beach to "Prince Charlie's Cave". Portree. This is the main town on Skye (population 2000) and is a great place to base your stay. I can recommend the Royal Hotel right in the middle of town and the Cuillin Hills Hotel about 1/2 mile outside. Lots of great pubs here too. The Old Man of Storr. On the A855 to Staffin, you can park and walk up to the Old Man, a 165-ft granite pillar in the middle of a lunar-like rock landscape. Kilt Rock. Further up the A855, just south of Staffin, you can pull off to the right to see the 180ft tall sea cliffs with bands of colors and a huge waterfall as the run-off from the nearby loch falls into the sea. Staffin. There's been a settlement at Staffin since 7000BC! It's a gorgeous place (see below) with excellent views north to Flodigarry and the Quirang rock formation (at upper left below). There's a good campsite just south of Staffin on the right where I've camped many times. I recommend driving down to the pier to get some good views. The Quirang. This is a really cool (and very large) rock formation that is a land slip. If you take the road from Flodigarry to Uig you drive through the formation. Flodigarry Country House Hotel. Great boutique hotel that also has an excellent bar and restaurant. Kilmuir Museum of Island Life. As you turn around the north corner of the peninsula, there's a crofting museum that's well worth visiting. Also checkout the nearby grave monument of Flora MacDonald, who helped Bonnie Prince Charlie at part of the disastrous 1745 Battle of Culloden. Uig. Not much here apart from the ferry terminal. I can recommend the Uig Hotel where I stayed over New Year in the 90s (New Year's Day was a wild, wild hangover day). It has fishing, horse-riding, and some great walks. Dunvegan Castle. This is an incredible castle and the home of the Clan MacLeod and the old Lords of the Isles for more than 800 years. The castle tour is an absolute must. Neist Point. From Dunvegan (going south) you take a small road on the right which leads out to Neist Point where there's an incredible walk over cliffs to the lighthouse. The Three Chimneys. This is a celebrated restaurant and hotel in an old crofting building on the shores of Loch Dunvegan. Book in advance! On the same road from Dunvegan to Neist. Talisker Distillery. This is the only whisky distillery on Skye and has a great tour around its famous and picturesque buildings. A must visit!